Awhile back I shared some tips for designing more engaging and contextual quizzes by simply adding custom background graphics. It was a simple idea but one that really helps visually align your quiz designs to the rest of your content slides. 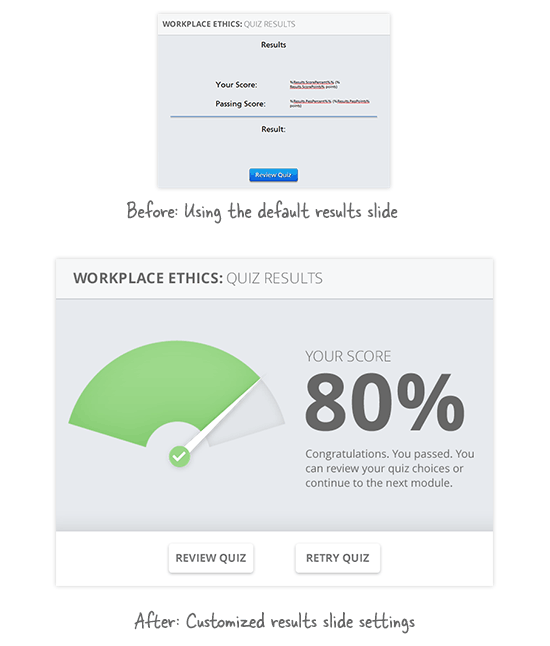 Yet, even with custom background graphics, the quiz results are often presented in default styles and layouts that don’t align visually with the rest of the content. 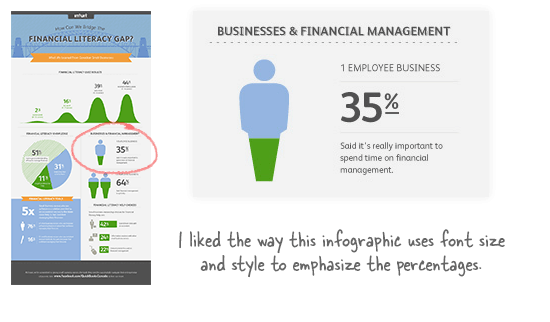 Here’s a really easy tip to get you started: Infographics. Remember our infographics challenge from a few weeks back? There’s still more we can pull from infographics to give our quiz results more impact. Infographics usually include some typographic foundations that we can apply in our own quizzes to communicate scores, percentages, whether our learners passed or failed. Notice that I didn’t use every option from the default results slide? With the simple, straightforward text below it, the percentage is sometimes enough. Pretty easy, right? Great—because that’s your challenge for this week. Storyline and Quizmaker both offer ways to customize results slides. If you have any questions about how this works, just ask in our forums and one of us will help out. This challenge is all about visual communication and not about development. This means you don’t have to build out an actual quiz with results. What you should focus on is presenting scores, pass-fail, and other results information to your learners. You can use Articulate Storyline, Articulate Studio ’09, Articulate Studio ’13, or PowerPoint to show your slide designs. To help you produce the most creative results for this week’s challenge, take a look at the results from last week’s interactive timeline challenge. This was our first challenge where everyone worked from the same starting project. The results were amazing! I know this was a bigger challenge than most, but you guys totally rocked it. Jeff Kortenbosch once again kicked off the week’s challenge with his interactive timeline. See how much his background choice enhances the whole visual? Nice work, Jeff! Ana Lucia Barguil really captured the overall design and interactivity in her challenge entry. As always, Ana shares not only her work but her source files. Be sure to give her a virtual high-five next time you see her around. Paul Alders shared his own interpretation of the interactive timeline in this terrific example. Be sure to visit Paul’s site to download the Storyline source files. Thanks for sharing your source files, Paul! Kevin Thorn joined the challenge with an amazing recreation of the project. What’s also neat is Kevin’s debrief on the project. He shares his workflow, development challenges, and how he worked around software limitations. Eimear O'Neill joined the challenge with her awesome timeline example. The harmonious color schemes and presentation of the embedded videos create a visually cohesive piece. Super job, Eimear! Have a results-driven week, E-Learning Heroes! @Zdravko - I'll add this one to the downloads by next week. I want to rework a few things so this is easy for you guys to edit in your own projects. Love, love the interactive timeline examples! Superb! Very nice Montse, The blurry background really interact with the video and the red circle with the thumb down shows me directly the most important information that I need.... a pity that I didn't passed ;) Great job! Nice one Montse. Did you choose to show pass/fail percentage and points on purpose? isn't it kind of showing the same twice? Hey Paul... Awesome! Can be easily used in an academic course, since it has a mathematical set theme... I also love you show not just quiz score but course progress! Here's my 5 cents :) http://www.seriouslearning.nl/challenges/131208/story.html I based it on a piece of an Infographic on nursing. Infographcs are what you want to search for when looking for design inspiration. I made my entry as simple as possible. I remembered a (long, long) discussion I recently had with our company legal counsel regarding the storing of quiz results in the LMS. They stated that kind of information was irrellevant as long as you could see if people passed or failed. So in this example I left out the actual score. It just cleans the slide up leaving the most important thing present. While I love the idea of making the results slides more meaningful, I'm not a big fan of using thumbs up and down imagery. I have a few reasons for feeling this way. First, thumbs down imagery has negative connotations (it is used to express dislike on blogs and sites like YouTube) so I am wondering if by using it in our courses we are inadvertently passing judgment on the learners. Second, hand gestures have different meanings in different cultures. The thumbs up gesture is considered offensive in some parts of the world. I won't go into what it means here but you can look it up if you are interested. Finally, strictly from a design perspective I think these gestures are over used and there must be more interesting ways to denote correct and incorrect responses. I'd be interested in hearing if anyone else has any thoughts on using thumbs up/down images in courses. Good point Nancy, Obviously it would/wouldn't work based on your target audience. I think the maturity of the company it's for plays a role to. More conservative companies might even prefer the default result slide over a redesigned one (trust me I've witnessed it first hand). Cultural issues- certainly the hand gesture meaning would impact if thumbs up/down "works". As for judgement- the second you add scoring- you are judging (ranking, rating). So, it's out there. Question- if someone answers a question incorrect on an assessment, how is this indicated (common answers are "red X, green check", "Incorrect"- sometimes in red, etc...). The fact that you add an icon (thumbs down) doesn't seem much more harsh (the second you say "wrong"- or even "0 points" it's out there). For me, the key thing is clarity. Is it clear whether the person "met expectations" or not? I've seen some companies try to be so sensitive about feedback, they diluted the impact of the message so much ("not the best answer") that the learners actually thought the answer provided may have been viable (when it was not). As a counterpoint- sometimes you don't need to clearly say "correct/incorrect", "pass/fail", but just show consequence of action (i.e. show actual business results of "failure"- you didn't make the sale, your computer gets infected). A clear outcome that maps to real-life consequence may resonate more than just being told correct/incorrect. I'm also not sure about thumbs up/down. I had a neighbor who lost a thumb. Hitchhiking was bad enough, then to be offended during a course would just be the straw breaking the camel's back. @Jeff. I wonder if an assessment of your target audience would go deep enough to determine the cultural backgrounds of everyone taking the course? If you were creating a course for an organization in the Middle East, for example, you would know not to use the thumbs up but it might not be so obvious in other situations. @ David, when it comes to scored assessments I agree that you are evaluating the results. I guess my thinking with the thumbs up/down is that you are aren't just evaluating a response - you are criticizing it. I'm not particularly PC so this shouldn't bug me but it does. I agree with you entirely that the outcomes need to be clear and that the best ones should show the consequence of an action. @Nicole - thanks for being a good sport. Your example was nicely done by-the-way. @Tom - you are joking right? Thanks everyone for this. This inspired me to refresh our quiz results template. It's pretty simple - 100 circles, giving a visual demonstration of percentage scored. https://twitter.com/salomemaloney/status/410356595520851968/photo/1 Interesting chat re thumbs up / thumbs down. I'm undecided at the moment. Alex, I am new to Storyline and saw your example above showing the number of circles filled in to match the percent. I am interested in hearing how this is done. Would you be so kind as to share your approach? Thank you. That looks really great, Alex! I love the visual representation with the dots and the fail icon. If it's okay, I wanted to show two super small changes that I might make to your graphic: https://articulate-heroes.s3.amazonaws.com/comments/elh-2013-12-06-beforeaftervq5ov0.png Because most of your slide is flat (no gradients, shadows, bevels) I thought the fail graphic seemed a little disconnected. And the only other change was to create more contrast between the percentage correct and incorrect by de-emphasizing the gray dots. I really appreciate you sharing your makeover with us!